On October 12th, I stopped by Sephora Times Square for the GLOSSYBOX & Koh Gen Do tweet up, to celebrate Koh Gen Do's launch in Sephora and their participation in GLOSSYBOX's September box. Guests enjoyed champagne, cupcakes and makeovers at Sephora's Beauty Studio. 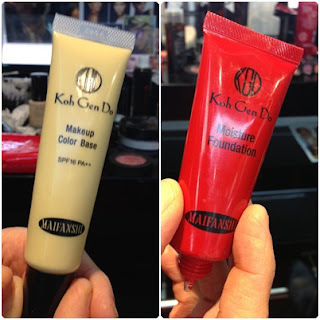 This was the first time I had actually tried Koh Gen Do products and I am hooked! My face felt clean and refreshed with the help of Soft Gommage Spa Gel and Cleansing Spa Water Cloths. My makeover looked flawless thanks to Maifanshi Color Base Yellow and Maifanshi Moisture Foundation. Koh Gen Do is available at select Sephora stores and online at sephora.com.